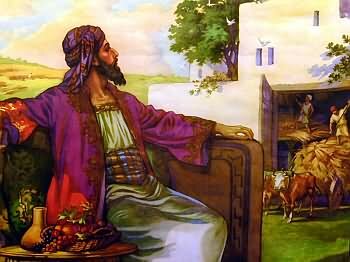 Jesus then shares a small parable about a rich man who hoarded his possessions. His barns aren't big enough for all the crops his land produces, so he decides to tear them down and build bigger ones. He does all of this so that he can relax, eat, drink and be merry for many years. Little does he know that God will demand his life that very night. This man has decided to store up wealth for the life here and now, but he is not rich toward God. In the same way, we can plan and prepare for a life of ease in our golden years without thinking beyond them. We worry about IRA's and 401K's without being rich toward God. Jesus explains this as a form of covetousness. We desire wealth and possessions more than we desire God's kingdom and His righteousness. (Matthew 6:33) In the end, this wicked desire will drive a wedge between you and God and the result is catastrophic. Yet we all fall prey to this in some form or another. We all want security in this life, but this world offers us no guarantees. I am not promised another day on this earth, but I still save my money, thinking about retirement. I still covet when I shouldn't. Fortunately there is one who forsook all covetousness for us. Jesus did not store up for Himself treasure on earth, but instead gave up everything, even His own life. He died on the cross to pay the penalty for your coveting and mine. Three days later He rose from the dead. He offers you eternal life, if you will repent and put your faith in Him. This man asked Jesus to judge between him and his brother. He coveted his brother's inheritance. But Jesus points this mans to a better inheritance. Jesus points him to an eternity where he can truly relax, eat, drink and be merry.